Looking for an easy and light weeknight meal? 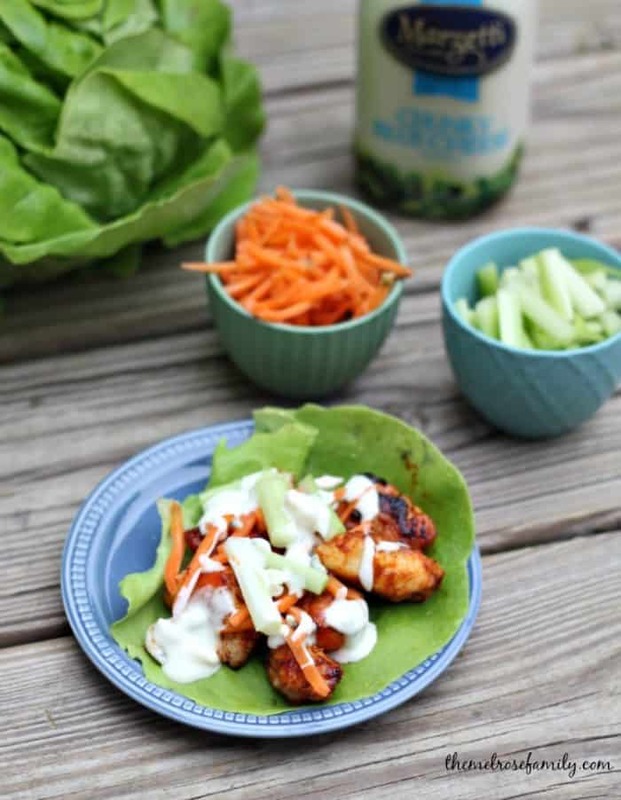 These Buffalo Chicken Lettuce Wraps are bursting with flavor and are still skinny so they’ll keep you on track! Warm weather for us means lighter food, which is why I love lettuce wraps this time of year. You don’t lose out on any of the flavor and you also don’t have that heavy feeling after dinner. We always seem to be running out the door once the nice weather hits. Especially since we threw a puppy into the mix. Now, we’re running out to take him on walks and train him. It’s a little like having a newborn except that they can be much more high strung and get into things. These buffalo chicken lettuce wraps are so quick that I don’t need to worry about what he is getting into because I can be in and out the kitchen in less than twenty minutes. Lettuce wraps have definitely become a common occurrence around our house since he arrived. We need quick, easy and delicious and this fits the bill. 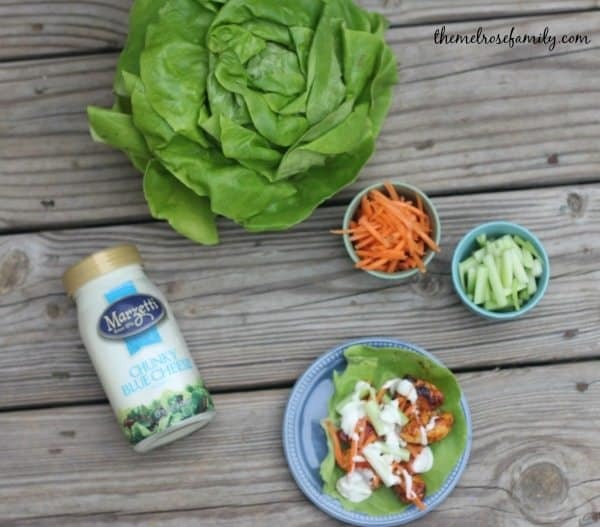 These buffalo chicken lettuce wraps are comprised of the buffalo chicken bite size pieces topped with celery, carrots and drizzled with Marzetti Chunky Blue Cheese Dressing. We love Marzetti Dressings because they are made with simple ingredients that enhance the flavors of produce. For more recipe inspiration check out the Marzetti Kitchen. You can also find inspiration on their Facebook, YouTube, and Pinterest channels. 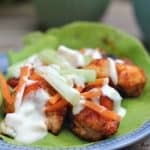 Looking for an easy and light weeknight meal These Buffalo Chicken Lettuce Wraps are bursting with flavor and still skinny! Cut the chicken tenders into bite size pieces. Melt the three tablespoons of butter in a large sauce pan and brown the chicken. Add in the 1/4 cup of hot sauce and coat the chicken. 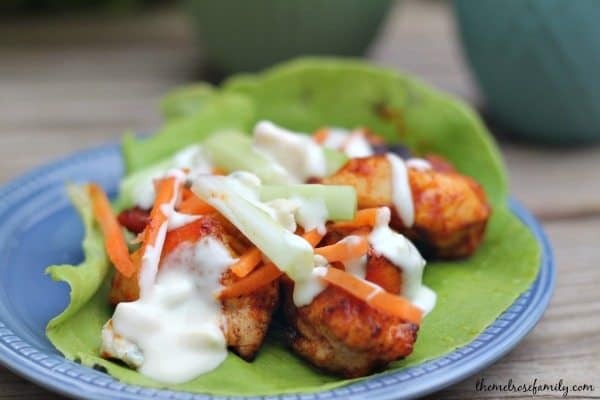 On each bibb lettuce leaf, place the buffalo chicken, a handful of carrots and celery. Top with crumbled blue cheese and drizzle Marzetti Blue Cheese Dressing. Since we love Marzetti so much, it only seemed fair that we share it with you via a $50 Gift Card! Enter below for your chance to win! I haven’t tried it yet, but the one I’m very eager to try is Light Raspberry Acai Salad Dressing! I like the Marzetti Spicy Avocado Ranch Veggie Dip. I like their Asiago Peppercorn Dressing. I’m a Blue Cheese lover, so I have to say the Chunky Blue Cheese for sure. I like the Chunky Blue Cheese variety. I like their Light Ranch dressing. I just love the chunky blue cheese one. yummy. My favorite Marzetti dressing is their Ranch. Their light ranch is my favorite. I have a new favorite – Avocado Ranch Salad Dressing. My favorite Marzetti dressing is the Italian With Blue Cheese Crumbles Salad Dressing. My favorite is the Simply Dressed & Light Veggie Ranch Dressing. Several functions you can do by making use of your Wii Remote Controller are listed below:. Does the sport have multi-player capabilities and exactly how well do these work.